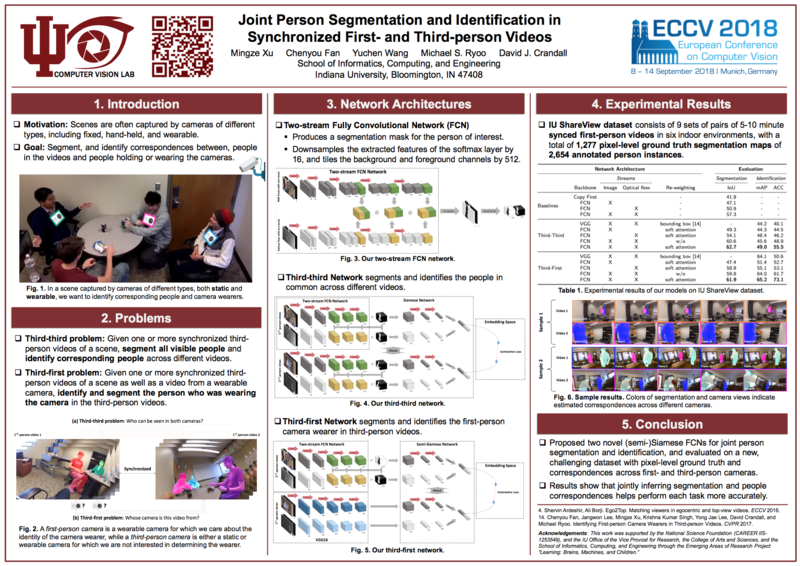 For more details, please see our ECCV 2018 paper. August 2018 — PyTorch code for training and pre-trained models is now available! August 2018 — IU ShareView dataset with pixel-level person annotations is now available! IU ShareView dataset consists of 9 sets of two 5-10 minute first-person videos. Each set contains 3-4 participants performing a variety of everyday activities (shaking hands, chatting, eating, etc.) in one of six indoor environments. Each person in each frame is annotated with a ground truth bounding box and a unique person ID. To evaluate our methods on person segmentation, we manually augmented a subset of the dataset with pixel-level person annotations, for a total of 1,277 labeled frames containing 2,654 annotated person instances.